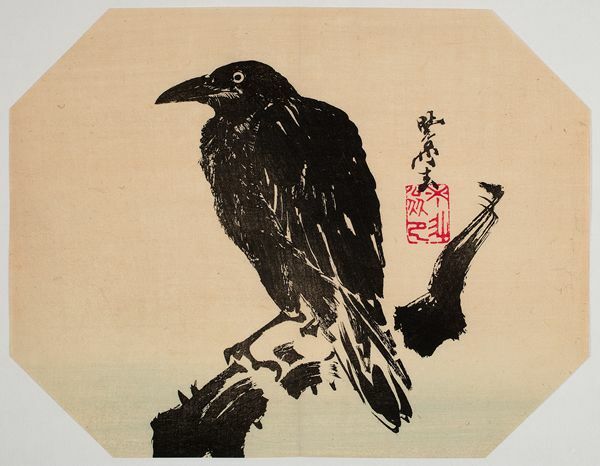 Kawanabe Kyosai (1831-1889)- Crow on a Branch. Circa 1880. Octagonal fan print. 22.3 x 28.9 cm. Fine impression, colour and condition. Faint centrefold (as always). 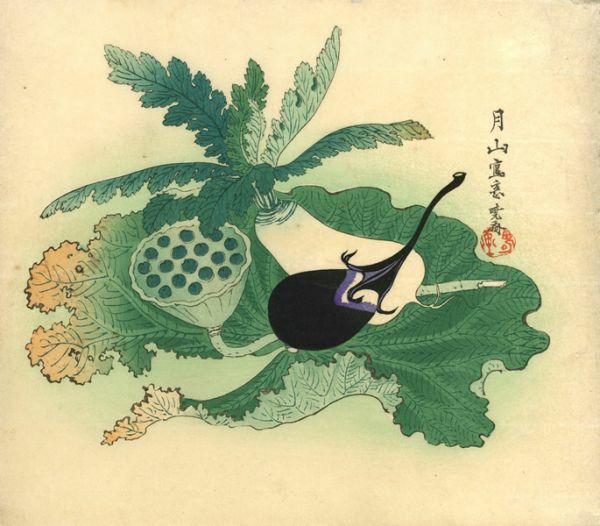 Shibata Zeshin (1807-1891)- A Mantis Amongst Gourds. Circa 1880. Octagonal fan print. Fine impression with faint centre-fold (as always). Fine colour. Small paper flaw at right, otherwise very good condition. 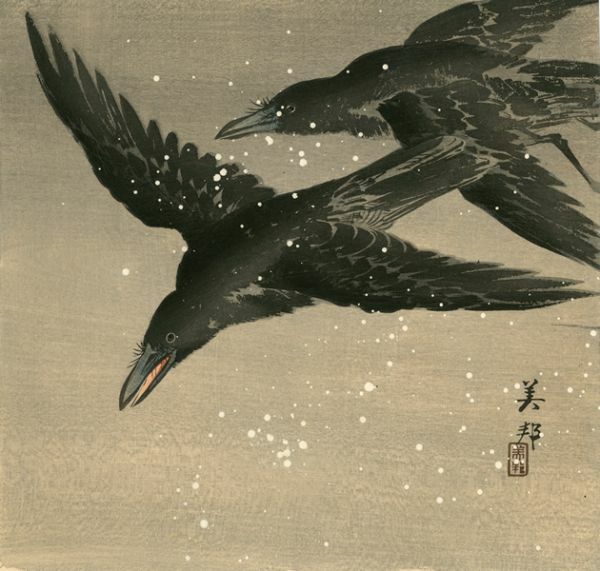 Kawanabe Kyosai (1831-1889)- Two Crows on a Plum Branch with Rising Sun. After 1885. 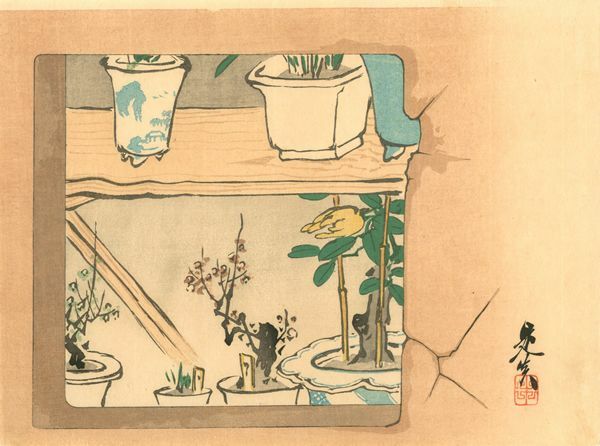 Kakemono-e. 69.9 x 26 cm. Clark, Demon of Painting: Kawanabe Kyosai, British Museum, frontispiece and plate 102; Kawanabe Kyosai: Selected Works from the Israel Goldman Collection, Tokyo, 2002, no. 68. Fine impression and colour. Very good condition. 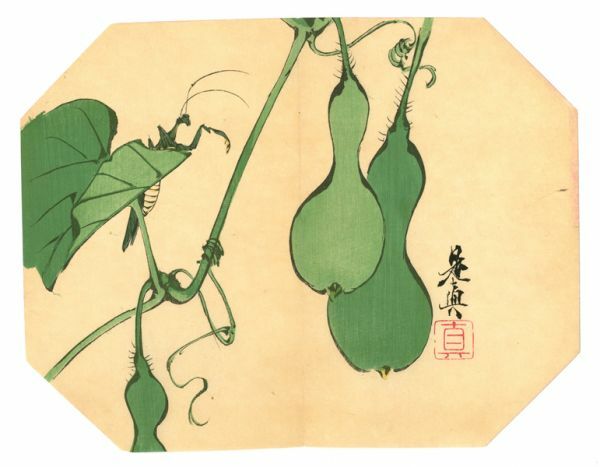 Takahashi Biho (1873-? )- Crows in Flight. Circa 1900. 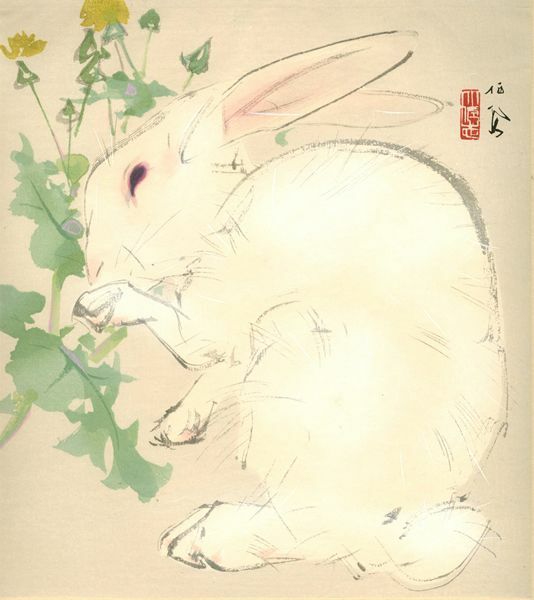 Shikshiban. Fine impression with splashed gofun for the snow. Fine colour and condition. Shikishiban. KKM, 1990, no. 313. Fine impression and colour. A few fox marks, otherwise very good condition. 1888. Shikishiban. 24 x 25.1cm. The New Wave no.33. Fine impression, colour and condition. Early 1900s. O-tanzaku. 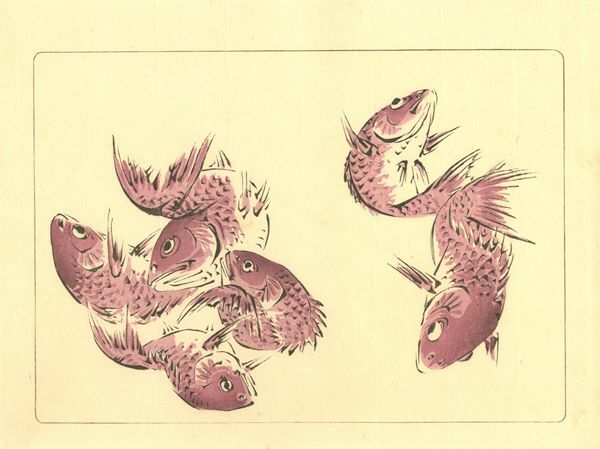 37.6 x 19cm. Crows, Cranes & Camellias, no. 48a. Fine impression with extensive blind printing and burnishing. Fine colour and condition. Utagawa Toyokun II (1777-1835)- A Hawk on a Branch with Rising Sun. Circa 1830. Vertical oban diptych. Fine impression. Very good colour and condition. Extremely rare. 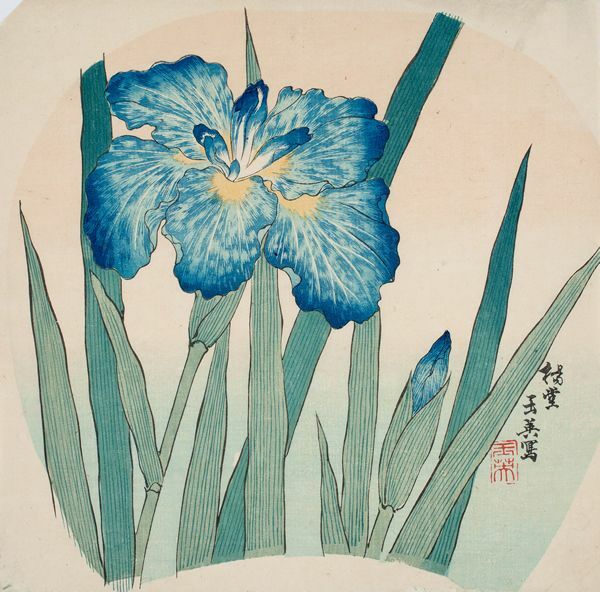 Yodo Gyokuei (Active Late 19th century)- Iris. Circa 1880s. Fan print. 24.2 x 24.9cm. Fine impression with extensive mica sizing. Fine colour and condition. 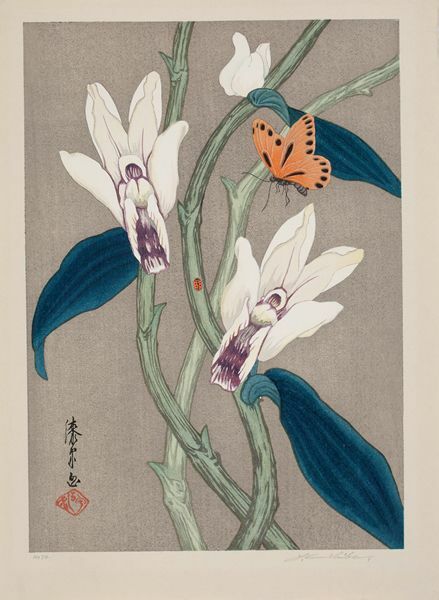 Urushibara Mokuchu (1888-1953)- Orchids with Butterfly and Ladybird. Circa 1920s. 34.6 x 25.2cm. Fine impression, colour and condition. Ca. 1930. Fine impression, colour and condition. Ca. 1880. Chuban. Fine impression with mica sizing on the fish. Fine colour and condition. Ca. 1880. Chuban. Fine impression. Very good colour and condition. 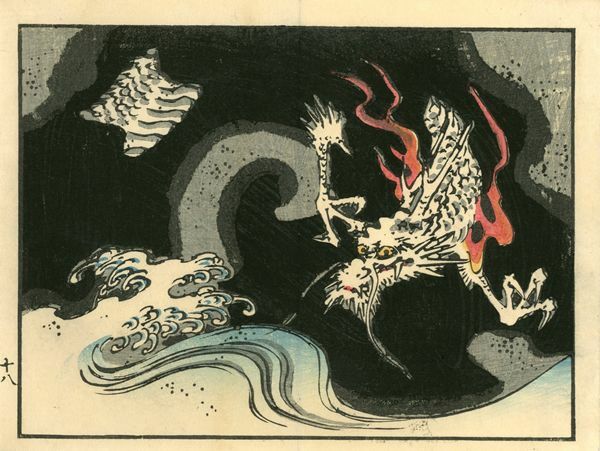 Utagawa Hiroshige II (1826-1869)- Dragon and Waves. 1860s. Album plate. Fine impression, colour and condition. Faint centrefold. Utagawa Hiroshige (1797-1858)- A Bird on Wisteria. Circa early 1840s. Chu-tanzaku. 35 x 11.6cm. Very good impression, colour and condition. A graceful aspect of this design is the way the placement of the poetry and the drawing of its characters echoes the stem of the wisteria.